So your company has seen the light and given you the ability and option to work virtually occasionally – or maybe regularly – now what? Initially you may feel the urge to do the happy dance, work in your P.J’s, and shower at lunch time. Or you may be hyper-motivated and start working even as you are drinking your first cup of coffee. In the beginning, you may feel energized and get a ton of work done in a very short time, but over time, you may find that you are getting distracted just like you did at the office. It’s just that there are DIFFERENT distractions. Instead of the chatty coworker stopping by and talking your ear off, it may be a neighbor in a crisis. Or a child home from school unexpectedly. Or a friend who wants to go to lunch. Or the plumber (since you are going to be home anyway…) The distractions can be endless. And these are just the people distractions. What about the home chore distractions? Messy office to clean? Laundry to do? Now it starts to seem like the noisy cubicle farm was actually less distracting. What’s a guy or gal to do? Sometimes it is the initial change of setting that makes us feel like we could take on the world. If you work at home all the time, going to the office may feel motivating. The trick can be to switch it up a little. • Need to feel professional for a phone call you are taking from home? Get up, shower, and get dressed in work clothes. You will be amazed at how your tone of voice and language change. You just upped your game! • Feeling a little lonely? Schedule a lunch date on a slow day. Good conversation and a change of scenery can make for a great afternoon. • Spending too much time at your computer? Make sure you schedule in time for a walk or for some stretching at least once (and preferably twice) a day. These breaks boost energy and creativity even more than a cup of coffee. • Have something that you really don’t want to do? Do it first thing in the morning. The rest of the day will be much more productive because that dreaded task won’t be hanging over your head. 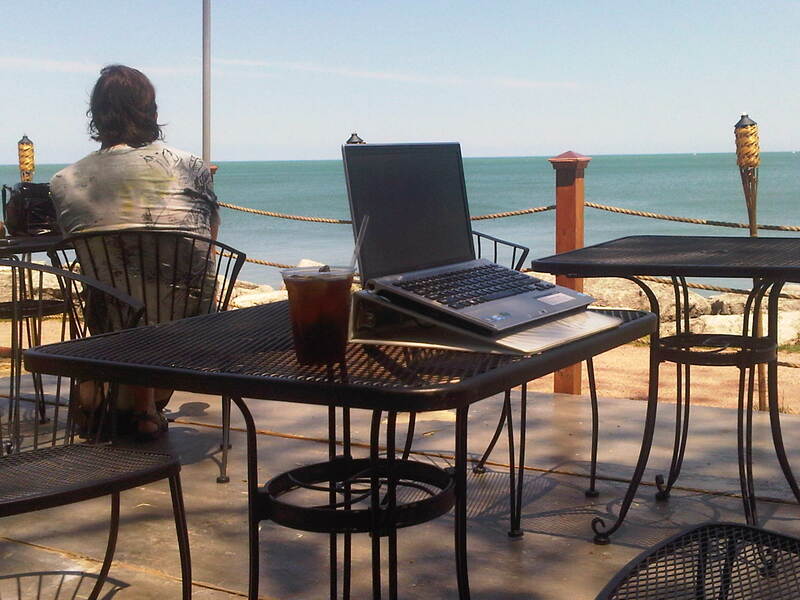 A change of venue can be just the thing to jumpstart your productivity – whether working virtually or in the office. If you are in a rut, change where you are working if you can, even if it is just for a day. Or add more structure to your day by scheduling everything, including your breaks, in your calendar. You will definitely get more done. All work environments have challenges but I hope these ideas help you stay focused and on track. Oh, boundaries! Something I didn’t really include and so important for folks who have partners or kids. As a single gal, I am truly terrible about doing that, Thank you for the reminder! Great advice here Catherine! I make to-do lists to help me stay on task. Whether working from home or at an office, I find it helpful to keep me focused. But when working from home, it is nice to take a quick brain break and do some dusting, or put a load of laundry in. It’s a nice luxury! Totally agree, Mary-Lynn. It is a nice luxury – as long as you don’t do it too often or to avoid doing something that is really important. Thanks so much for the comment! Great suggestions! Understanding the potential hazards of the mundane day to day distractions and a plan to avoid them is very important if you want to be productive from an work at home environment. I like the advice to mix it up. Also, I find that doing some exercise in the morning sets me up for the day. Lastly, if you present to people over something like GotoMeeting or Adobe Connect during your day, you might like these tips to keep online meetings productive.